A Vigilante is a 2018 American drama film written and directed by Sarah Daggar-Nickson in her directorial debut. It stars Olivia Wilde, Morgan Spector, Kyle Catlett, C.J. Wilson, Tonye Patano, Chuck Cooper, Betsy Aidem and Judy Marte. It had its world premiere at South by Southwest on March 10, 2018, and was released on March 29, 2019, by Saban Films. In November 2016, it was announced Olivia Wilde had been cast in the film, with Sarah Daggar-Nickson directing from a screenplay she wrote. Randall Emmett, George Furla, Andrew D. Corkin, Lars Knudsen and Ambyr Childers will serve as producers on the film, under their Badlands Entertainment, The Long Run, Uncorkd Productions, Emmett/Furla/Oasis Films and Parts & Labor banners, respectively. The film had its world premiere at South by Southwest on March 10, 2018. Shortly after, Saban Films had acquired U.S. distribution rights to the film. It was released on March 29, 2019. 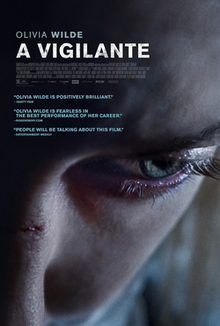 A Vigilante received positive reviews from film critics. It holds a 91% approval rating on review aggregator website Rotten Tomatoes, based on 22 reviews, with a weighted average of 6.85/10. On Metacritic, the film holds a rating of 69 out of 100, based on 11 critics, indicating "generally favorable reviews". ^ Fleming Jr, Mike (November 1, 2016). "Olivia Wilde To Star In Emmett/Furla's 'A Vigilante'". Deadline Hollywood. Retrieved September 10, 2018. ^ "A Vigilante". South by Southwest. Retrieved September 10, 2018. ^ Siegel, Tatiana (September 8, 2018). "Toronto: Saban, DirecTV Nab Olivia Wilde Pic 'A Vigilante' (Exclusive)". The Hollywood Reporter. Retrieved September 10, 2018. ^ Crust, Kevin; Cooper, Matthew (January 10, 2019). "Winter movie preview: 'Captain Marvel,' 'Miss Bala,' 'Dumbo' and a complete list". Los Angeles Times. Retrieved January 10, 2019. ^ "A Vigilante". Rotten Tomatoes. Retrieved April 5, 2019. ^ "A Vigilante Reviews". Metacritic. Retrieved April 5, 2019. This page was last edited on 5 April 2019, at 13:12 (UTC).